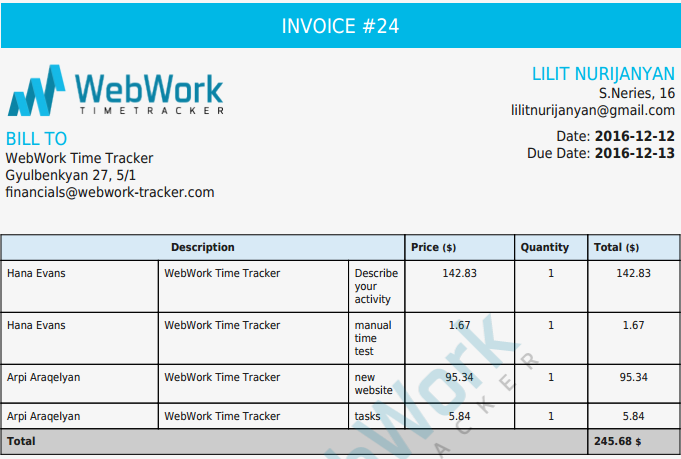 WebWork Time Tracker users are able to generate invoices and send them to their clients or partners. To be able to generate an invoice user needs a billable contract. Billable contract should have an hourly rate. Please note that there is only one Currency (USD-$) in the WebWork Time Tracker system. 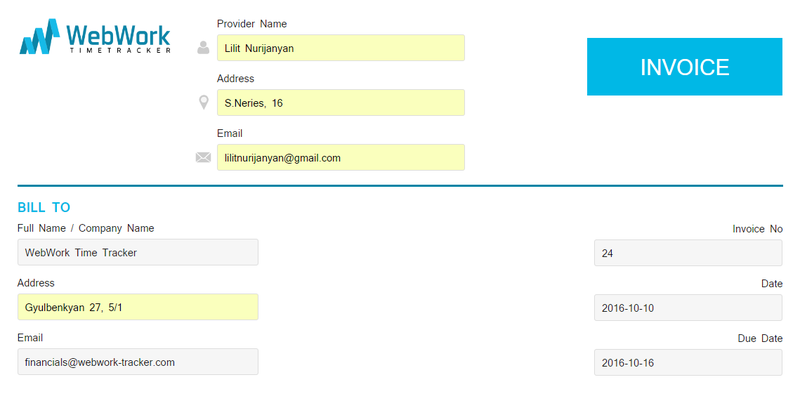 Use the filters of Projects and Users of your team to get the right invoice. Project – You will see the projects and the amount spent on them. Activity – You will see all Activity Descriptions of selected users and projects and the amount. Please note, that Activity Report amount might have a slight difference comparing to other reports, because the Activity Report consists from several separate data, and the amount of each is being rounded separately. Fill required information of the Invoice Provider. Fill the “Bill to” information, Invoice number and the date range of the provided Invoice. Now you have your invoice generated in a table. You need to check the projects and make sure this is exactly what you need to send to your client. You need to export the invoice and then decide you want to print it without downloading or you want to download and email it to your client.